I love books. Being surrounded by them provides a sense of comfort - as though they're good friends who never change, always give the same opinion and are completely content to sit quietly on the shelf until you're ready to hear them again. I've tried this with my other friends and it's really really hard to get them to comply. 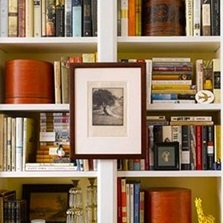 In decor magazines, blogs and TV shows, however, you rarely see a shelf with more than a few books on it. Sure, it may be much more aesthetically pleasing if you use your bookshelf to display a slew of highly expensive yet thoroughly useless tchotchkes, but then it's a little less of bookcase and a little more of an "I have too much money and should no longer be allowed to shop by myself" case. I'm sure that there are also those who have significantly more room and can artistically scatter their books throughout their manors on a myriad of gleaming, professionally coordinated bookcases. Alas, I don't currently happen to be one of them. And so, we are left with this problem: how to use a bookcase to its fullest potential, while providing some artistic appeal and avoiding a discordant feel. After we solve this, we're moving on to world hunger. 1. Pare Down: Nearly every project I work on starts this way. Yes, I love books, but yes, I also have some in my possession that I frankly won't ever read or really didn't care for that much and have no reason to keep. Be as objective and clinical as you can and move anything that falls into this category into a *Donation Pile. 2. 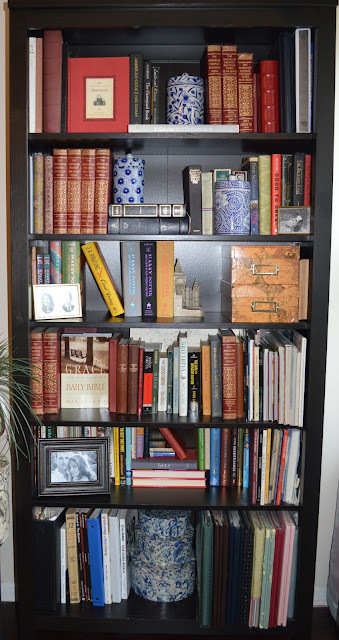 Set the largest books aside: Most bookcases only have one or two shelves that are tall enough to accommodate tall art books, photo albums, music or even files. If you have any books of the Big & Tall variety, place these first. - Arranging by color. Create rainbows, sunsets, striped sections or color fades with hued groupings. (note: Some people find it more difficult to find specific books when the books are grouped like this). - Sorting by Size. Personally I'm not a fan. I think it's a little too mundane for the eye. But hey, for the "size matters" crowd, this one's right up your alley. - Positioning by favorite. Create your own groupings based on what you'd like to be the most convenient. Books that you read or lend often should stay at eye level, while books that you love but aren't likely to toss in your bag for a weekend away can remain on higher shelves. 4. Shelving, Ho! Here's where the fun part starts. Remember that it may take a couple of tries to get it to the point where it feels cohesive. - The Pile: Stack books on top of one another in a horizontal mound. Piles can be used as bookends for standing stacks, pedestals for displaying decor elements, or even as shelves for smaller books to stand on top of. - The Tilt: Exactly what it sounds like. Tilt a book slightly and balance it between two stacks. This visual sliding board not only highlights the leaning title, but also can act like an arrow to the book beneath it. - The Spiral Pile: Stack books one on top of another rotating each slightly to create a helix. Though interesting to look at, this form only works if it's free-standing. - The Lateral Gradient: Place books with covers showing outward with each one slightly (Either parallel to the back of the shelf, or at a slight angle). Again, this arrangement is not the most concise, but if you have a little extra room it's a nice way to show off some titles and add movement to your shelf. - Remove dust jackets: For some of my Might-Not-Be-Worth-Anything-But-I'll-Shank-You-If-You-Don't-Return-It books, I'm not too worried about removing dust jackets. I keep the jackets neatly piled in a flat box in case I ever want to return them to their original positions, but often hardbacks look much lovelier without the illustrated covers. 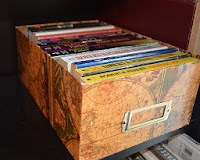 - Turn 'em Around: If you hate the spines, cover and back of a book, consider turning it around. 6. Accessorizing (The fun part! ): Select a few key pieces to display along with your books. Choose from framed pictures, art, sculptures, bookends, candles or anything with an interesting shape or color that you can display. 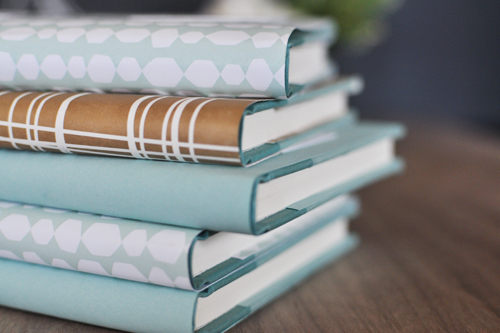 Note: I don't want to throw anything crazy at you, but books tend to be rectangular (I hope you're taking notes. This is stellar stuff). Try adding accessories with different shapes- rounded, oblong, spiked, peaked or otherwise. Various textures - metallic, greenery, fabric, glass, pebbled or glittery- add depth, interest and complexity. 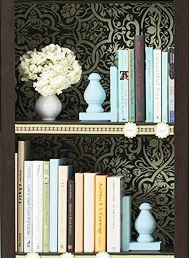 - Paint: choose a bright, coordinating color and paint the inside of the bookcase. The extra pop of color is unexpected, yet subtle enough to not distract from the rest of your room. - Paint part deux: If the issue is that you don't want your bookcase to stand out, try painting it the same color as the rest of the room. It gives the subtle impression of a built-in, for a fraction of the cost (and commitment). 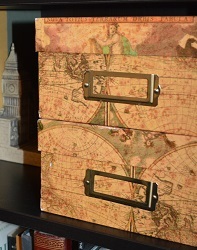 maps or wrapping paper can be decoupaged to the back, or stencils can be applied with paint in a matter of hours. - Frame Job: Adding a piece of art to the outside of your bookcase is a chic means of adding some character. To avoid a hole in your furniture, hang using a Command Strip. Make sure that you have the correct size for the weight of your particular piece of art! *Note: As soon as you're done with this project TAKE all superfluous books and donations to a drop off. Do not allow the pile to sit for any length of time or your resolve and momentum may dwindle and you may wind up with the unneeded books still in your possession!